It's that time of year again. Holiday decorations are everywhere. Shopping madness is underway. 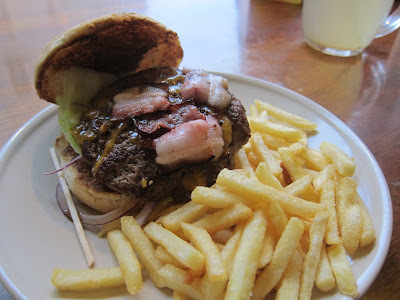 And I've got my list of hamburgers I've eaten in the past year. Last year's list was huge and had too many sub-par burgers. The compilations from 2008 and 2009 are distant memories. I must repeat my standard disclaimer: This is not a list of the "best" burgers. It is a purely subjective survey of the ones I either liked or disliked the most, based on my personal taste. For example, I prefer flame-grilled beef seasoned only with salt, perhaps pepper, and classic, American-style construction and toppings. I tend to look down on excessively creative reinterpretations of time-honored standards. I now present the 16 hamburgers I have consumed from my least favorite to the most enjoyable. 16. Greenz Restaurant Since they didn't have a straight up bacon cheeseburger, I had the "Ultimate Burger." The patty was like meatloaf, which is not acceptable in my book. 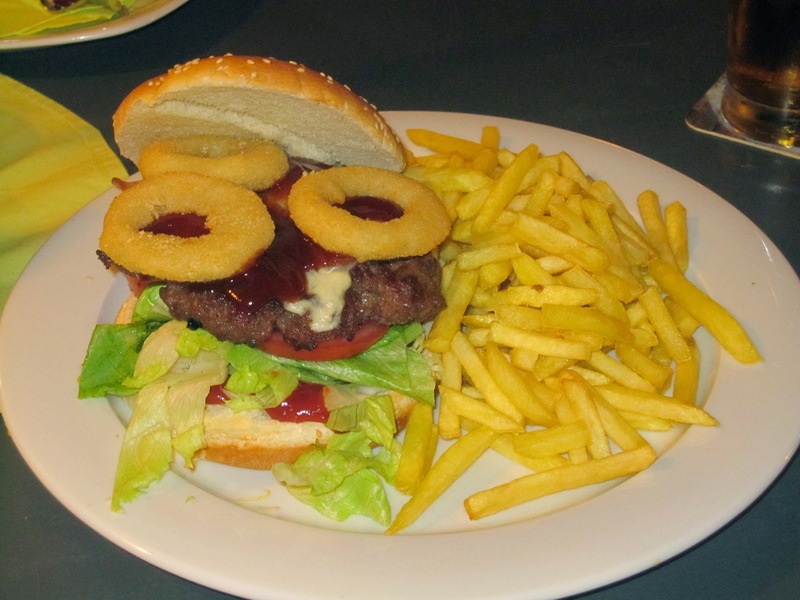 It came topped with bacon, cheese, lettuce, tomato, barbecue sauce, ketchup, mayo and Burger King-like onion rings. It was an overloaded bomb to eat, priced at 179 CZK with fries. 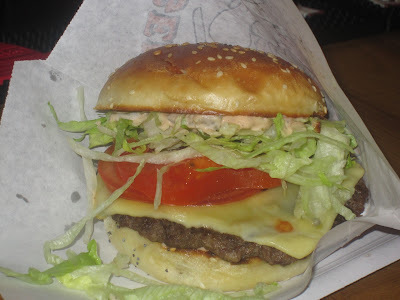 The "classic" with only lettuce, tomato, ketchup and mayo is 129 CZK. I do love the irony of "Prague's first salad restaurant" specializing in steaks and burgers. 15. Bohe(my)a Lounge and Grill Bar The best I can say here is that this burger was large, it had good grilled onions, and it was not too expensive. The patty was decidedly un-American. The ground beef was mixed with onions, herbs, and spices. It had what looked like parsley in there. The bun had tons of mayo. There was too much curly red lettuce. For what it was, the taste wasn't bad, but the burger was a total mess to eat. The steak fries were nice and crispy. The price was 148 CZK. On a sour note, the ketchup bottle said "Heinz." However, the watery red sauce that poured so freely out of it said "cheap Czech stuff." Thankfully the tapas there are much better than the burger. 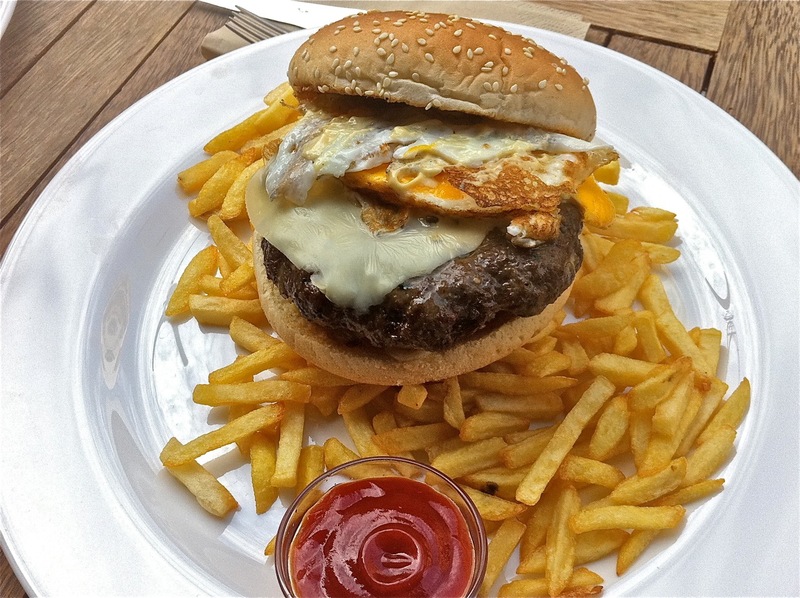 The restaurant is an outdoor rooftop, so the burger is only available in warm weather months on non-rainy days. 14. La Republica I was seduced from afar by this burger. But goods looks alone are not enough for a long-lasting relationship. Not for me, at least. 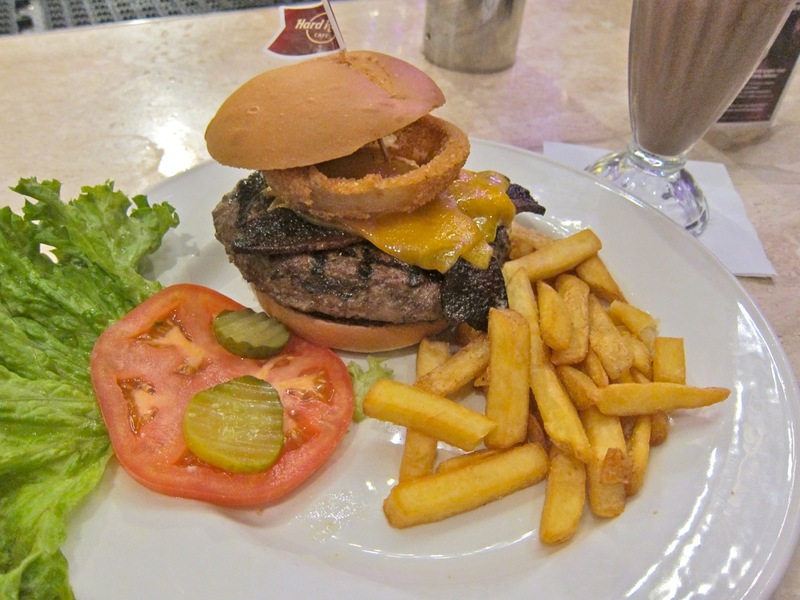 The patty, topped with egg, was a rubbery meatloaf, mixed with all sorts of non-standard items. Not good. When it comes to classic burgers, less is more. Don't reinvent the burger wheel. This restaurant was open for a short period during the summer when I tried this. It reopened after a redo last week. I can only hope they have reconsidered their attempt at this too clever by half recipe. And that they shouldn't be so stingy with the ketchup. The only good things were the fresh, quality bun and that it was 155 CZK. 13. Mlsnej Kocour The dense, overcooked patty was no fun. It had a smoky flavor, but I think it was due to mixing with smoked meat rather than from the grill. There was lettuce, tomato, pickle, no ketchup, and too much mayo. Bad Czech ketchup was brought later, on request. It came with fries and the price was decent at 165 CZK. 12. Yes Burger I like to champion the little guy (or burger joint) when I can. I just can't do it here. I've heard happier tales from others, but my one experience was lackluster. The patty was thin, dry, and overcooked. The bacon was undercooked. The cheese was melted into oblivion. The beef sat on a small bun with tomato, pickle, red onion, and too much lettuce. The patty warmed the toppings, or should I say "bottomings", to an unpleasant state. 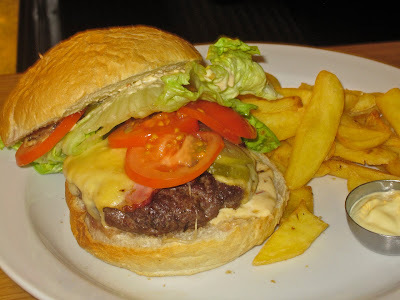 This burger was the best bargain of them all at 65 CZK plus fries for 20 CZK. But cheaper is not always better. I am in no hurry to go back. 11. Kobe Several people have raved about and recommended this burger to me over the years. I finally broke down and went for broke at this high-end steak and sushi joint. Their offering fell far short of expectations, according to my standards. On the positive side, it had an enjoyable smoky, grilled flavor and good grilled red onions. However, the puck-like beef patty had several negative issues for me. The meat's grind was too fine and the fat content too low. This made for an overly dense, chewy patty. A very lean burger is not a good burger. The bun was inundated, top and bottom, with an herbed mayo that overwhelmed the meat and cause it to slip and slide. The bacon was so thick it could be served separately as smoked pork belly. That's not a crime, but it's not the classic style I look for, either. The final insult here was the price. 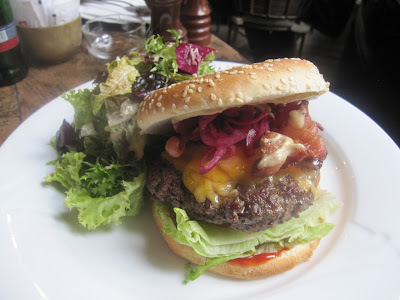 The burger by itself cost 320 CZK. A stingy serving of fries was an extra 50 CZK. And to add injury to insult, a small dish of ketchup was 20 CZK. That's a grand total of 390 CZK for the combo. Not worth it. 10. Burger King Every year, I include a sample from Burger King as a "control" of sorts. To my mind, this is not necessarily a low bar. I actually like BK in moderation and this limited edition, flame-broiled XXL Bacon Double Cheeseburger was a pleasure. 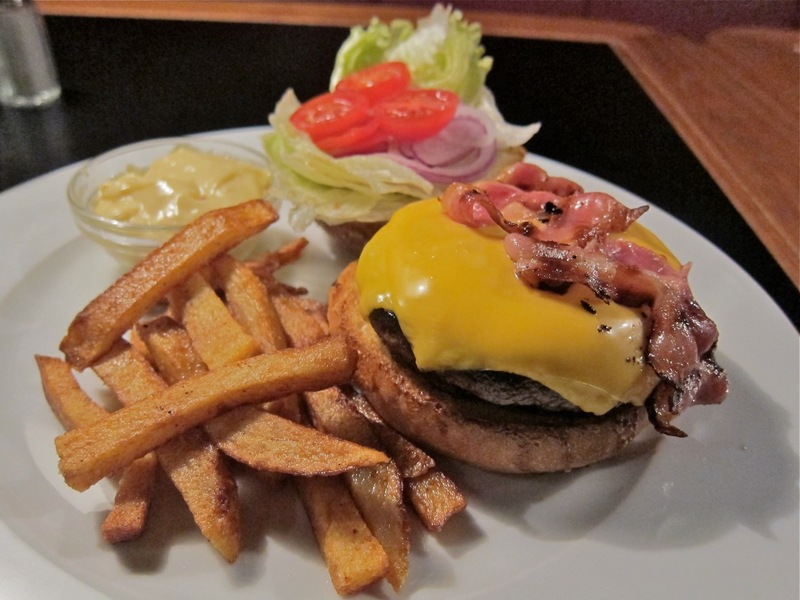 Sure, the American cheese was a too processed, but the bacon was better than usual. It was a smoky, heavy beast that mainlined straight to my heart (and that's not all good). 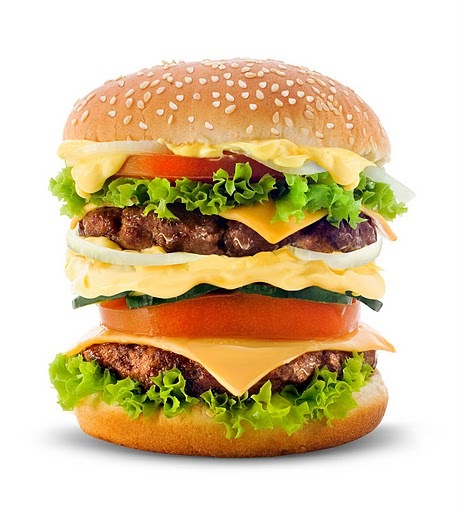 Yes, I would rather have this burger than all of the above. 9. Kofein Restaurant This is one of the few burgers I like that falls outside the classic construction category. It was served on a grilled ciabatta. I've made them myself on this crunchy Italian bread and I like it. Overall, it has a homey taste and feel. 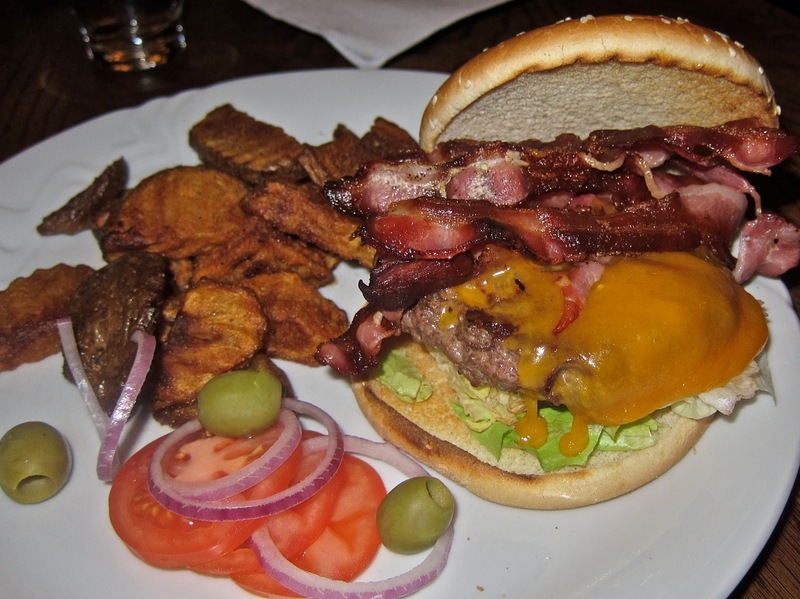 The burger includes grilled onions, soft bacon, cheese, shredded lettuce, and a tomato-mayo mixture. There may be something extra mixed in the beef as it was a little more rubbery than it should be. But it had a lovely charred crust and it was quite juicy. The first time I tried it, it was overcooked. But the second time it was cooked medium on request. Either way, it had good flavor. The burger comes with great, homemade steak fries for just 125 CZK. 8. LokalBurger These burgermeisters don't have an actual address. You have to check their website to see where they'll turn up next. I caught them at Bukowski's cocktail bar and I'm glad I did. The well-put-together burger consisted of top-quality ground beef, a lovely homemade bun, lettuce, pickles, too much tomato, and special sauce. It reminded me vaguely of the In-N-Out Burger I had recently in California. It's the closest you'll find in Prague, anyway. 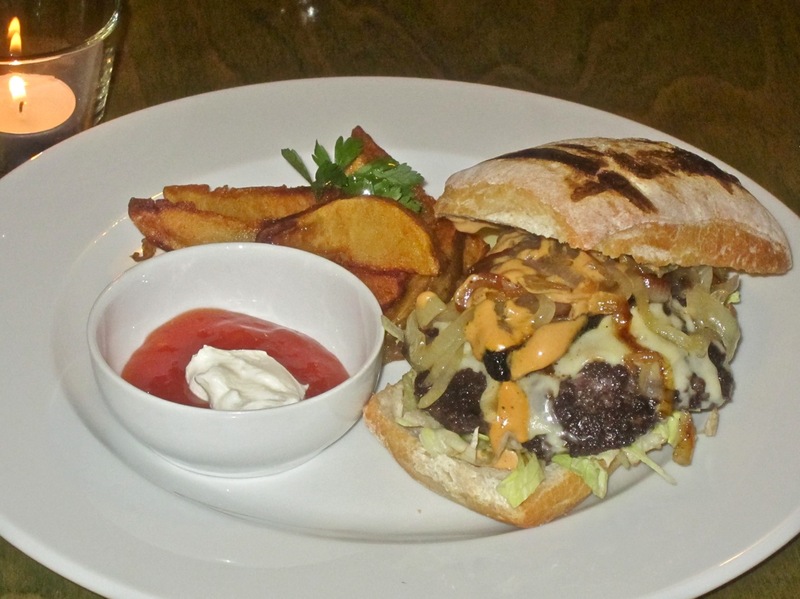 This 95 CZK burger went down very nicely with my tasty Bukowski's beverage. 7. Bohemia Bagel in Holešovice The Bohemia Burger with bacon and cheese was once at the top of my list. I still think it is pretty good, but the mighty burger has fallen in my esteem. 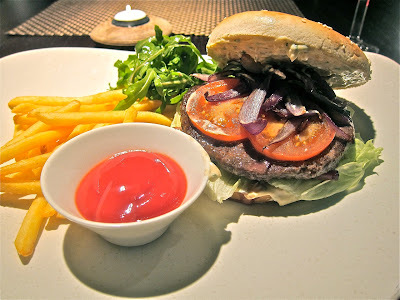 The big, thick 200 gram patty was made with good ground beef and had good flavor from the grill. There was a generous amount of smoky, properly cooked bacon. A bottle of Heinz is provided and they offered decent, but not crisp enough homemade fries, salad, or a combination of both. 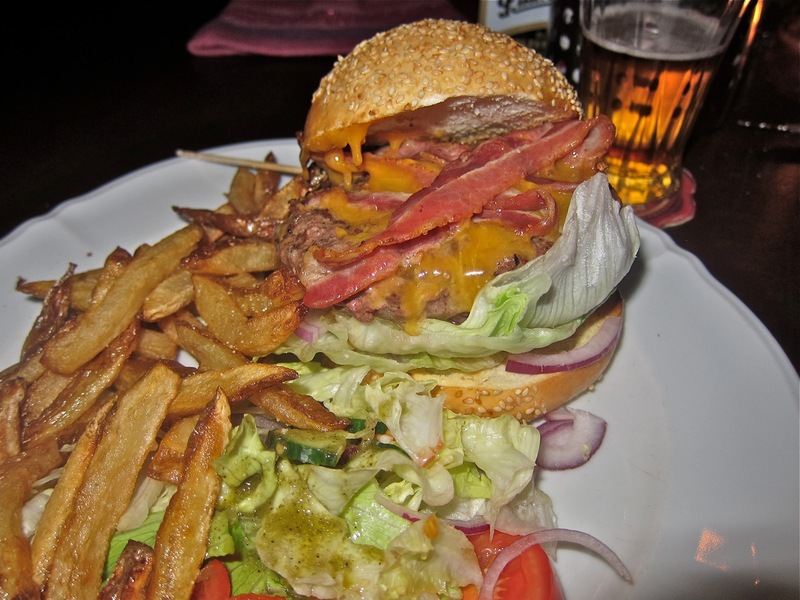 As for the negatives, the burger is served with all toppings already on it, including way too much lettuce. I don't like that. The bun was their sesame seed roll that held up well, but was much too chewy. Overall, it is the best value, with all of the above for 165 CZK. 6. Krystal Mozaika Bistro The meat was the star here. It was high-quality ground beef, cooked medium, very juicy, with no excessive seasoning beside salt. The bun was homemade and top notch. The bacon was cooked to a fine chewy crunch. The burger came fully assembled. It has pickles, which I like. But there was way, way too much mayo mixed with whole grain mustard that caused the bun to lose structural integrity. The thing fell apart in my hand before the last bite. Next time, I'd take the advice of a reader and ask for the mayo on the side. The 150 gram burger was 169 CZK, but the fries were an extra 39 CZK. 5. Fraktal I hadn't had the Fraktal Burger in a couple of years. It was just as I remembered it, which is to say pretty good. There were, however, a few flaws. Though cooked over a fire, there isn't much grill flavor in the salty 150 gram patty. I asked for medium, but it was cooked all the way through. The cheese was bland. Some bacon was perfectly cooked, but some was fried to an improper hardness. They get extra points for putting the lettuce, tomato, onion, and pickle on the side, along with a bottle of Heinz ketchup. Despite the issues, there was some burger synergy, it all worked well together, and I liked it. It comes with fine fries for 185 CZK. 4. Potrefena Husa on Vinohradska This burger was compact and well-built. It was not the largest one out there, but it's enough to get the job done. They use good ground beef, but often overcook it past medium. It was too lean and was not juicy enough. The bacon was smoky, but soft and more English style. They give you thick mayo on the site, but a tiny dish of ketchup costs extra. Do I use it on the burger or the fries? Do I order a second dish? These are questions I'd rather not contemplate. I like that they put the toppings on the side so you can build the burger as you want. I enjoy this burger and have it a few times a year. This is partly because I live near the restaurant. Unfortunately, it was also one of the most expensive at 250 CZK. 3. Resto Cafe Patio (AKA Le Patio) This restaurant on Narodni has a well-built, fine-looking burger. But the beauty is not just bun deep. The patty was thick and juicy and cooked to medium as requested. The bacon was just right and the cheese was above average. On the downside (for me at least), is the very fact that the burger comes pre-constructed with lettuce, tomato, vinegary red onions, ketchup and mayo. I personally prefer more control over the type and quantity of condiments and toppings. It comes with a cute wicker basket of good fries, but only small dishes of ketchup and mayo -- no Heinz bottle. Even so, it was a very tasty meal and friends who also ordered it also liked it very much. 2. Hard Rock Cafe This burger was my favorite last year. And it was still great this year. Yes, this is an international chain, but they hit the right American notes, with a giant, flame grilled 280 gram (10 ounce) patty. The brioche bun was actually too small for it. Toppings were lettuce, tomatoes, pickles, and an onion ring. The price was also seriously hefty, weighing in at 320 CZK. 1. Restaurace Jama This burger was truly excellent. Let me count the ways. The large thick patty was a perfect medium -- a hand-formed taste of home cooking. The fat content of the loosely packed, coarsely ground meat was just right, probably around 20 percent, giving just the right amount of juiciness. The generous portion of bacon was cooked in crispy American style, only slightly overdone. There was real cheddar and it was the best cheese I found. That is as it should be. The cheddar was an extra 39 CZK on top of the 175 CZK bacon burger. It also came with crunchy, skin-on potatoes along with a rack of condiments, including Heinz ketchup. As an overall package, including price, it just worked for me, hitting most, if not all of the right notes. So that's my list. I'm sure there are some great burgers out there that I've missed. Feel free to let me know in the comments. Spot on Brewsta. Restaurace Jama, well Deserves its Number 1 Spot. Would Pick Bohemia Bagel, Holesovice, as My Number 2. How about Crazy Cow? I liked their burger quite a bit. 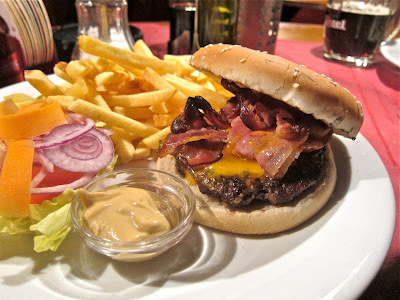 Best burger i´ve had so far in Czech Republic was with no doubt the one in Blackdog Cantina in Beroun. High quality ground beef cooked perfectly medium, home-made brioche buns and DIY attitude of the American owner made a great combination. 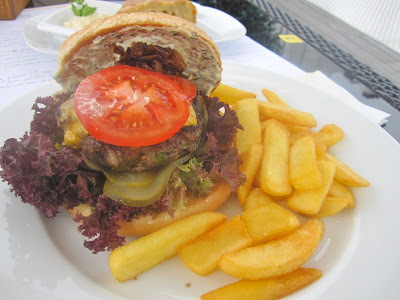 Not that far from Prague, I ocassionally visit Beroun just for that burger. 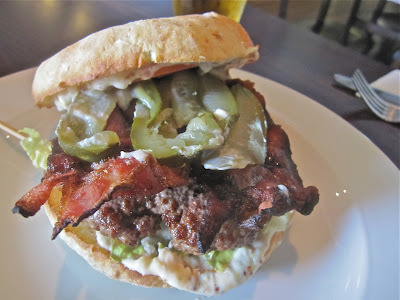 I agree with Richard, Infarkt burger from Blackdog Cantina is the burger of the year for me. As a medical microbiologist who has seen too many cases of Ecoli O157 and the horrific medical consequences from undercooked hamburger I cannot stress enough hamburger must always be cooked well done. I enjoy burgers but will never have a medium rare burger. So, finally made it to Jama. Was not a bad burger, but for 175 you could expect some more love for the detail, specially as everyone expects it to be the No1 burger, so they should take extra pride in making it perfect, each and every day. Patty was good, thick, juicy. Salad was cut in to little pieces, not a leaf you can eat in a bun. Onions sliced very nice and thin, but only outer rings- no olives this time. Tomatoes ok, fries were homemade (or at least out of the "home made" deep frozen bag), but soggy, not crisp. biggest problem was the bun, which was cold, not toasted (no marks whatsovever), and I would say..just old. Fell apart really easy, made eating the thing unpleasant. Didnt care to spend 39 extra for the cheese, perhaps that would have glued the construction together, but this should of course not be necessary. Soooo...stumbled over "FeelGood" burgers this weekend, almost opposit of Yes´ (..) at Staro. Range from 30 to 65, only had the 2 top burgers, one with bacon, other also cheese. this is a proper burger joint (although streetsign says "kebab and pizza"), everything is handmade on the spot, fresh patty out of plastic wrap, not frozen. buns toasted on flat grill together with the onions, cheese melting done in pizza oven. The patty is almost ridiculously big, but flat enough to eat and not crumble. cant say I am absolut happy with the texture, its not home made, but not too rubbery, either. but the overall experience of this hot, juicy, gooey,fruity, meaty block of godness makes up for it. I feel sorry for the guy who loves burgers but has never had one mid-rare.